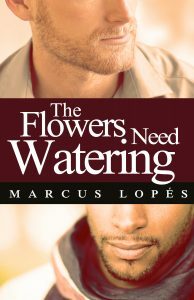 I was terrified about self-publishing my latest novel, The Flowers Need Watering. While many authors have self-published books, this was a first for me. I was putting out in the world something that I was completely responsible for. I didn’t have the machinery of a big publishing company behind me. I had to do it all on my own. After receiving the Mobi file from my formatter so I could upload the eBook version to Amazon, I saved the file and tried to forget about it. When I mentioned to my creativity coach that I’d received the formatted file, he asked if I was still on target for my release date. My initial response to him was that I decided to hold off for another week. I wanted to do more pre-release promotions. But that wasn’t true. The truth was this: I was scared. But I dug deep and found the courage to hit “Publish” on Amazon and my book went live. And I haven’t looked back. That’s why I believe that when we commit to our dreams, providence move with us, nudges us forward. My decision to self-publish was not easy. Maybe I should try to get the manuscript published via the traditional route, I often mused whenever doubt reared its ugly head. Then I’d think about what that process involved — sending out my manuscript to numerous publishers and waiting for a response. I did that in the past, sometimes receiving a note of encouragement about my writing even though the manuscript was declined for publication. But more often than not, I received the standard form letter rejection. My writing doesn’t necessarily fit nicely into one niche or genre. When deciding between traditional and self-publishing, I was forty-two then and I didn’t feel like waiting for someone else to value my work. That was what prompted me into self-publishing. Once the decision was made, all of a sudden the necessary people and tools popped into my life. Various editors and proofreaders started following me on Twitter and offering their services. And speaking of editors, I can’t recommend Dave at thEditors.com enough. His insights helped me to tighten the plot, create engaging (although not always likeable) characters, and a better book overall. Cover designers and formatters also became part of my Twitter followers. Stopping for coffee one afternoon at Atlas Espresso Bar and expressing my frustration over a formatting challenge, another customer suggested I check out InDesign by Adobe, which turned out to be a very useful tool. Self-publishing didn’t seem so far-fetched or impossible as it once did. So with the support and encouragement from my friends, my believing mirrors, I went for it. And I’m happy that I did. People who ask me if I think my book will be a bestseller or how many copies I’ll have to sell to “break even” miss the point. By self-publishing my book, I proved to myself that I had the willpower, discipline and courage to achieve something great. I showed up daily to do the necessary work. I faced down doubt and naysayers because I saw my worth, and believed in myself and my dream. Have you committed to achieving your dream? I encourage you to complete one task today that moves you closer to making your dream a reality. Ask yourself this: What is the one thing I can do today that will help me achieve my dream? Then do it. And let me know what you did and how you feel. Make your dreams your priority today. As a writer, as an artist, it is an axiom that I take to heart: Know thyself. And this is where I find myself, one more time getting to know myself. At the beginning. Maybe not exactly at the beginning but somewhere in between. For this journey has been long and unscripted, helping me to grow into the man I’ve always dared to be. And the journey continues, propelling me forward so that I might, finally, see my worth. But for the moment, let’s go back to the beginning. My name is Marcus Lopés and I am a writer. I write because each morning when I awake, and at night when I lay my head down to sleep, writing is what becomes me. It quells within me, gnaws at my heart, enlivens my soul. I write because of the stories within me that I long to tell. I write because of the beauty that is this world. I write because of the ugliness that is this world and perhaps, with my words, I can challenge it. I write because I have a vision of today that may spillover into tomorrow. I write because it is the passion that consumes me. I write because writing is all of me. Writing is who I am. For over twenty years, writing has been the constant in my life — my anchor and refuge. Writing, in its own way, has given me life. The point is this. There’s nothing else in this life that gives me a greater sense of satisfaction than when I’m at the page creating memorable characters and weaving together intricate plots. Writing is the first thing that I do in the morning when I wake up. That pushed me to ask the question, Who will I become in 2017? And now the answer is clear: Extraordinary. I don’t mean extraordinary in the sense that my goal is to become some world-famous writer or YouTube sensation (but I suppose that could happen). I mean extraordinary in the sense that I’m going to do what so many people are afraid to do. I’m going to focus on what matters. For me, that is writing. In this day and age, I don’t have to wait for one of the big publishing companies to accept my novel. If I’m willing to invest the time, energy and resources necessary to put together a great book, I can publish it myself. I don’t have to be always waiting on someone else to recognize my worth. I know my worth. I see my worth. I’m willing to take a risk on myself because I believe in myself and my dreams. That is why I’ll soon be releasing my first self-published novel, The Flowers Need Watering. So I welcome you this day to be a part of my journey. This isn’t about becoming a bestselling author or being nominated for literary awards … This is about sharing my passion with the world because each and every day I am doing what I love. 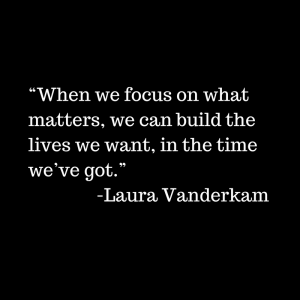 Are you willing to build the life you want in the time that you’ve got?